Japan has released the Consumer Confidence and Retail Sales y/y and the US will publish Beige Book, Prelim Wholesale Inventories m/m, Prelim GDP Price Index q/q, Goods Trade Balance, Prelim GDP q/q and ADP Non-Farm Employment Change. 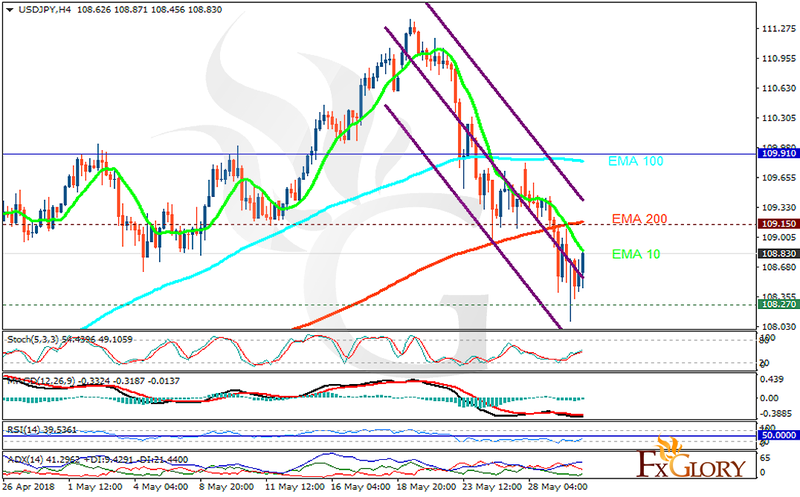 The support rests at 108.270 with resistance at 109.150 which both lines are below the weekly pivot point at 109.910. The EMA of 10 is moving with bearish bias in the descendant channel and it is below the EMA of 200 and the EMA of 100. The RSI is rising towards the 50 level, the Stochastic is showing upward momentum and the MACD line is below the signal line in the negative territory. The ADX is showing weak sell signal. The resistance level breakout will push the pair up towards 110 otherwise it will probably drop to 107.5.